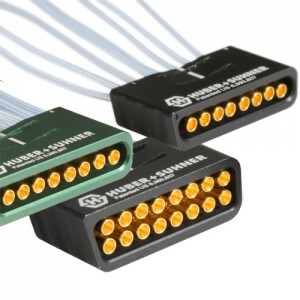 HUBER + SUHNER complements the successful multicoax MXP40 system, which operates in the range up to 40 Gbps/40 GHz, with the cost-effective solution MXP18 for the range up to 18 Gbps/18 GHz. With reliable mating and ease of use that make them both especially suited to bench-top and system testing, the solutions can also be used as an interconnect within automated semiconductor test equipment. MXP18 offers excellent value for money and allows testing at the highest level.